Through this blog we shall make you familiar with TDS on Rent under Section 194I of The Income Tax Act. Budget 2017 has brought certain important amendments to the provisions related to TDS on rent, we shall highlight the same as well. Rent is a crucial component of the monthly budget for majority of us.Right ! Some of us add to our revenue through Rental Income by renting out property and other assets while others pay rent thereby using these rented assets. So,its necessary to know the various tax provisions related to Rent.The one we shall be discussing here is the Tax deducted at source or TDS on Rent component to make you know it better. 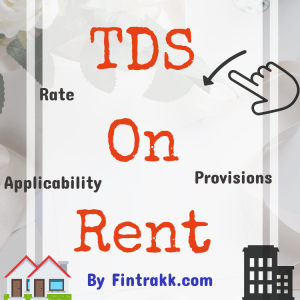 So, be ready to grab deeper and useful insights on this section TDS on Rent. We have tried to clarify in Question answer form in order to keep it really simple and easy to understand. 1. What is the meaning of “Rent” under Section 194I? So, payment with regard to any of the above shall be considered as Rent under this section and relevant provisons shall apply. 2. Who has the liability to deduct tax or TDS i.e. who is supposed to deduct tax? The person(not being individual and HUF) who is responsible for paying rent is the one who is required to deduct tax at source or TDS. In simple words, if you are paying the rent you have to deduct TDS at the time of making payment. Individuals/HUF who are liable for tax audit are required to deduct tax at source. ALSO READ What is Form 15G & Form 15H? When to submit and avoid TDS! In simple words, a tenant has the liability to deduct tax at source while making payment to the landlord. Note : Budget 2017 has brought an amendment which states that w.e.f 1st June 2017 under Section 194IB wherein an Individual or HUF (who are not covered under Tax audit) who pay monthly rent to a resident in excess of Rs.50000 are also liable to deduct tax (TDS) @ 5%. (This has been explained in detail below). 3. What is the limit for TDS i.e. on what amount the liability to deduct TDS arises? If the aggregate amount of rental income paid or credited or likely to be credited exceeds Rs.180000 during the financial year TDS is applicable.This limit is per taxpayer. But, in case of Individual and HUF (not liable for tax audit) this limit is Rs.50000 per month (as per new inserted Section 194IB). You may also like : 12 Tax Free Income in India ! 4. What are the TDS rates applicable? *As per Section 194IB : It is 5% If rent >Rs 50,000 per month and is paid by Individual/HUF who are not liable for tax audit. 5. When TDS is required to be deducted? At the time of payment by cash,cheque,draft or any other mode whichever is earlier. Advance rent is subject to TDS i.e. if landlord collects rent in advance and it meets other conditions as stated above, Section 194I shall apply. No TDS is applicable on Refundable Security deposit.e.g. If landlord collects security that shall be refunded at the time of vacating the building, such amount is not considered as income of landlord, section 194I is not applicable. If the person receiving rent i.e. the landlord doesn’t furnish his PAN then Tax (TDS) is deductible at the rate of 20%. If Nil tax is applicable on the person receiving rent i.e. landlord has income below taxable limit.Then he can file Form 15G or Form 15H for non-deduction of TDS. Finance Act, 2017 inserted a new provision, Section 194IB in the Income Tax Act which states that Individuals and HUF who pay a monthly rent of Rs 50,000 or more need to deduct 5% tax at source. This new tax provision is applicable w.e.f 1st June,2017. Earlier professionals and businesses falling under scope of Section 44AB(Tax audit) were required to deduct tax. As a result of which various categories of tenants were not supposed to deduct tax at source. But,w.e.f 1st June,2017 the scope and applicability of TDS on Rent has been widened.Now, other tenants like salaried individuals or the ones not liable to tax audit are also required to deduct tax at source U/S 194IB @5% of total rent paid or payable if rent paid exceeds Rs.50000 per month. These were the minute but crucial details about TDS on Rent that you must know. We have tried to cover all the important points that will surely add to your knowledge. You are a landlord receiving rent or you are a tenant paying rent, getting acquainted with the necessary tax provisions is anyways helpful.So, the next time you pay or receive rent, you will surely be in a better position to tackle any such compliance. You may also like : 7 Best Long Term Investments in India ! Hope all your doubts have been cleared regarding TDS on Rent under Section 194I. Feel free to share your valuable feedback or any queries thereon in the comment section below. I have a question about the possibility to refund of TDS. Can an NRI get the refund of TDS deposited by the tenant on rental income and/or deposited by Bank directly from interest on NRO account? I read that 30% TDS is applicable for NRI renting property in India? Does slab bracket, as applicable to residents apply on the income of NRI generated through rental income? Please reply. « Happy Loans : A Fresh Outlook to Banking !